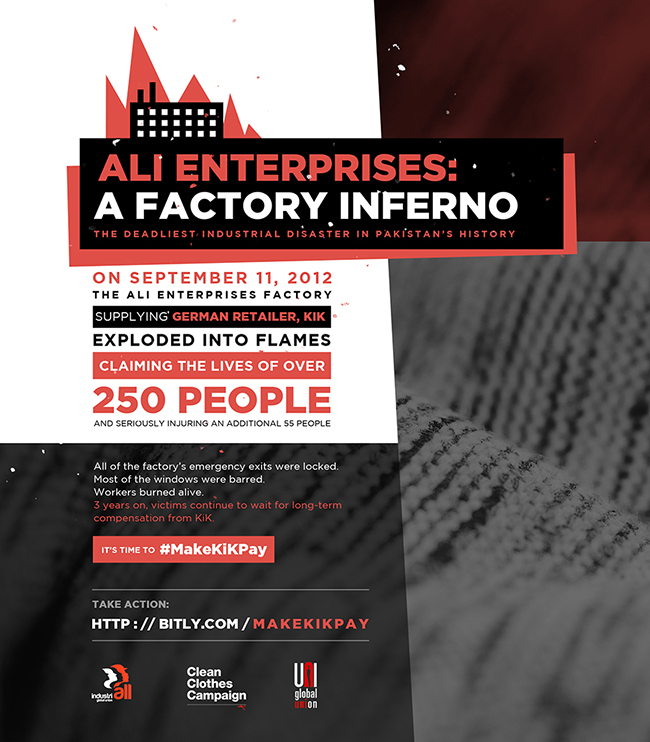 On 11 September 2012, at around 6pm the Ali Enterprises factory in Pakistan exploded into flames, claiming the lives of 254 people, and seriously injuring 55. In the wake of the disaster, among the carnage and destruction also lay bundles of denim with German-language labels carrying German retailer KiK’s brand “Okay Men”. After the fire it was revealed that the factory’s production was dedicated to making jeans for the German retailer KiK. It was also reported that plant managers forced workers to stay, ordering the gates to be closed in order to try and save the company’s stock: piles of jeans destined for KiK stores.One survivor stated, “They prevented people from leaving, so they could save the clothes” – KiK’s jeans. KiK’s complete disregard for workers’ safety has cost thousands of lives in Pakistan and Bangladesh. It has a startling track record of sourcing from some of the most dangerous factories in the world. KiK is the only company in the world that has been linked to the worst three garment factory disasters in recent history – the Ali Enterprises factory fire in Pakistan; the Tazreen factory fire in Bangladesh; and the Rana Plaza factory building collapse. A total of 1,500 garment workers are dead as a result of these tragedies. Thousands more were injured and continue to battle with life altering injuries. Three years on, victims of the Ali Enterprises fire continue to wait for long-term compensation. Despite their promises, and even signing a legally binding agreement, the German retailer KiK is refusing to pay long term compensation for the victims’ families.